All Indie Magazine: Interview with Darlingside: "Turning Classical into pure East Coast Indie Rock"
Interview with Darlingside: "Turning Classical into pure East Coast Indie Rock"
With literally thousands of new independent artists that are unsigned and unheard outside of their local scene and not all artists know what it takes to grasp and connect with their audience not only by offering a sound that is something fresh and original, but have a sound that can appeal to multiple generations. 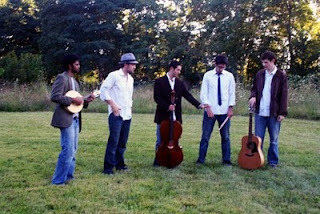 North Hampton, MA Indie Rock band, Darlingside does just that. Led by voice of Don Mitchell that is almost androgynous yet very masculine seems to command a sense of dominance with his incredible vocal skill. While Don plays a major role for the band’s unique sound, credit cannot be taken away from the other band members, because without the band, Darlingside would be just a typical Indie Rock band. 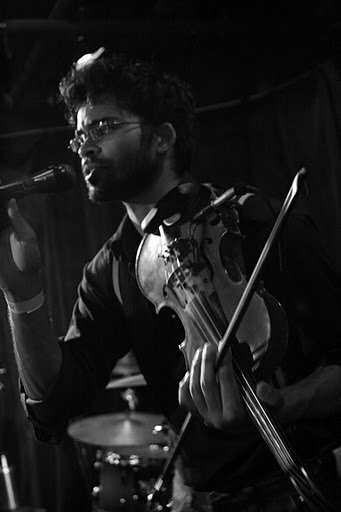 Darlingside are: Auyon Mukharji on violin, mandolin, and vocals, David Senft on bass and lead vocals, Harris Paseltiner on cello, guitar, and vocals, Sam Kapala on drums and vocals, and Don Mitchell on guitar and vocals. What makes Darlingside stand apart from the competition is the collective sound of the violin, mandolin, cello, bass, acoustic guitars, percussion, even the pennywhistle all melds together in perfect harmony like a well rehearsed orchestra…something unexpected from an unsigned band. Although they fit within the Indie and Alt Rock genre, it is hard to compare them with any other artist, because they posses such a unique quality, their sound can only belong to Darlingside . Their debut CD, simply entitled “EP 1” is jam packed with an invention of a four part vocal harmony that combines the sound of the violin, the cello, the guitar, and percussion that keeps the listeners captivates from the first song to the last. You’re my third band submission from Northampton. I may have to take a trip up there and check out the rest of the talent. Are all the bands there as good as you guys? We're fortunate to have a great music scene up in Northampton. A few of my favorites are The Primate Fiasco, a pyschedelic dixieland group featuring tenor banjo, brass and tuba for the bass, and Bella's Bartok, a self-described acoustic gypsy punk circus group. There are also a great number of fantastic venues in the area, including the Iron Horse Music Hall, the Montague Bookmill and The People's Pint and the Rendezvous, so there's alway something going on. Originally, Darlingside was just Dan, Dave, and former guitarist, Shea Chen that started the band? 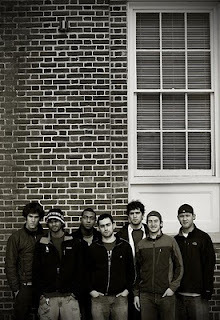 Darlingside was originally myself, Dan, Dave and former guitarist Shea Chen. All four of us were dorm-mates at Williams College, a tiny school in northwest MA. We had all been friends for awhile, and all of us had taken a singer/songwriter class with the acclaimed local songwriter Bernice Lewis while at school. 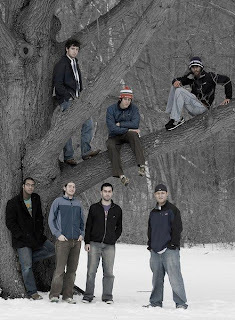 The summer of 2006, just before our senior year, we were all on campus and decided to make a project out of the band, which we had discussed for a long time but never got around to doing. Four years later, you’re still performing and you’ve recruited Sam Kapala, Don Mitchell, Harris Paseltiner, and Auyon Mukhari along the way. I know Shea, Dan, and Dave took Singer/Songwriter class together, but how did the addition of your new members come about? We recruited three new members in the fall of '06-- bassist Eli Walker, cellist/guitarist Harris Paseltiner and drummer Sam Kapala. All Williams guys, and all of whom had been good friends and musical collaborators for the preceding years. That 7-man outfit lasted through the spring of 2007, at which point myself, Dan, Dave and Shea all graduated. We all went our separate ways for the following year, and then in the fall of 2008, Dave and I spoke to Harris and Sam, who were still in school, about starting the band up again. Dave and I moved to Northampton to hang out while Harris and Sam finished up their last year at school, during which we picked up Don Mitchell, who Harris, Dave and I all sang with in an a cappella group at Williams. After Harris and Sam graduated, all five of us moved into a house just outside of Northampton and we've been going ever since. Dan, Eli and Shea are now all pursuing alternate professional careers with great success, and they remain extremely close friends of the band. We wouldn't be half the band we are today without their contributions and continued support. Are you all best friends and hang out together when you’re not on the set or on stage? We live together, cook our meals together and still hang out on top of that. We were all close friends in college, so existing in such close quarters, although it can occasionally get difficult, is still a pleasure. Did you ever have a different title for the band? When we re-started the five-member outfit, we toyed with the idea of changing the name, but nothing really seemed appropriate. It's been Darlingside from the start. How did the name, “Darlingside” come about? A number of us took the aforementioned singer/songwriter class with acclaimed MA singer/songwriter Bernice Lewis during a "Jan-term" course at Williams. One of Bernice's favorite phrases with regards to songwriting is that you have to "kill your darlings," when writing, meaning you should focus on writing a cohesive piece, so when you have a phrase that you might love but that doesn't really relate to the song, get rid of it. Darlingside was originally conceived with a "c" (like homicide or fratricide,") but we figured that was a little morbid, so we went with the "s" and the story. Most artists tour alone with just an acoustic guitar, while other bands have maybe a total of two band members. You guys have 5-band members! How do you guys manage to stay together, especially when money is such a scarce commodity? We cut costs wherever we can. Living and eating together in a small town like Northampton is a big help on our budget, and we focus on getting a mix of private events, college gigs, festivals and music venues to help us pay the bills. We also all have odd-jobs around town, like teaching gigs or selling gluten-free cookies. I was reading the Darlingside blog and Dave and Auyon are currently on a min-tour through Europe. Wasn’t the band supposed to disburse for a vacation from performing? Obviously not! With the release of your new EP back in May, are you done touring your release shows or do you have another round of tours lined up introducing your new CD to the public? We are focusing on a mix of touring and writing for the fall, and have a few exciting festivals lined up (including The Utica Music Festival in mid-September and Dewey Beach Music Conference at the end of the month). Gigging and getting our sound out is still a top priority, since we're such a young outfit. September 1st is our 1-year anniversary. Who are the song writers of Darlingside? We all contribute to the writing process. Harris, Dave and Don have been doing the bulk of arranging and lyric-work, but our unique mix of instrumentation forces us to do a lot in our rehearsal studio as well. Was there one thing that motivated the lyrics or does each song have a separate motivation? Each song definitely has its own motivation. We have so many songwriters that we can't pin down one single motivation or influence. What is your favorite song in comparison to the bands favorite song to perform or do you all share the same opinion? Ha-ha! I don't know if I have a favorite song. It depends on my mood. If I'm excited about ripping on the mandolin, then "Daylight," (a brand new tune not on the EP) is the highlight of my night. If I'm more excited about mellowing things out, then "The Catbird Seat" or "In the Morning" are the top two. As far as the band, I think we're all a bit too mercurial to really pick a consistent top dog. Having five members in a band, do you ever disagree on the arrangements or do you seem to meld together pretty easily? Sure, there are definitely disagreements, but that's something you expect when the creative process is shared among five opinionated members. We are close enough that we are able to leave our creative disagreements in the studio and not let it interfere with our relationships outside of the band, though. I know you just released your debut CD in May, but what else is in store for Darlingside? Gigging and writing, mostly. I still feel like we have a lot of work to do in getting our sound out to the northeast, and we've had a lot of luck landing festivals and shows that we are excited about for the next 6 months. Are you guys currently working in the studio to create your next album? We plan to get a lot of the writing groundwork done for another album this fall/winter, and hopefully we'll get back into the studio in early 2011. Any possiblity of a music video? Absolutely. Be on the lookout in the fall. Really wonderful post!...I think nobody can be brief as like your post! Thank you for bringing a well thought comment to the discussion.